Is Mercury’s core liquid or solid, and why — on the smallest planet in our solar system — is it so big? What can the planet closest to the Sun tell us about how our solar system came into being? An unmanned European-Japanese space mission, dubbed BepiColombo, blasted off early Saturday morning from French Guiana, to probe these and other mysteries. “BepiColombo is coming like a white knight with better and more precise data,” said Alain Doressoundiram, an astronomer at the Paris Observatory. “To understand how Earth was formed, we need to understand how all rocky planets formed,” including Venus and Mars, he told AFP. First, however, the suite of instruments on board the Ariane 5 rocket will have to travel seven years and nine million kilometres (5.6 million miles) to reach their destination. 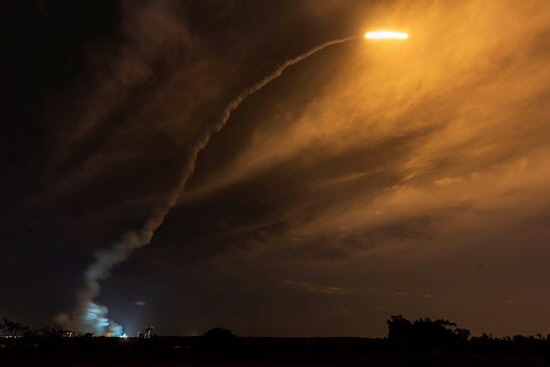 In a statement after the launch, ArianeGroup said the satellite had successfully escaped Earth’s gravity field and was beginning its long journey where it will reach speeds of up to 40,000 kilometres (25,000 miles) an hour. According to Pierre Bousquet, an engineer at France’s National Centre for Space Research and head of the French team contributing to the mission, Mercury is “abnormally small,” leading to speculation that it survived a massive collision in its youth. “A huge crater visible on its surface could be the scar left over from that encounter,” Bousquet told AFP. Finding out if this is true is on BepiColombo’s “to do” list. This scenario would explain why Mercury’s core accounts for a whopping 55 percent of its mass, compared to 30 per cent for Earth. Mercury is also the only rocky planet orbiting the Sun beside our own to have a magnetic field. Magnetic fields are generated by a liquid core but given its size, Mercury’s should have grown cold and solid by now, as did Mars. This anomaly might be due to some feature of the core’s composition, something BepiColombo’s instruments will measure with much greater precision than has been possible so far. On its surface, Mercury is a planet of extremes, vacillating between hot days of about 430 degrees Celsius (more than 800 degrees Fahrenheit) to super-frosty nights of minus 180C (minus 290F). Those days and nights last nearly three Earth months each. Earlier missions have detected evidence of ice in the deepest recesses of the planet’s polar craters. Scientists speculate that this may have accumulated from comets crashing onto Mercury’s surface. “If the presence of ice is confirmed, it means that some of those water samples date back nearly to the origin of the solar system,” Doressoundiram said. Mercury is 58 million kilometres (36 million miles) from the Sun, nearly three times closer than Earth. “The planet is whipped by solar winds,” a constant torrent of ionised particles bombarding the surface at 500 kilometres per second, said Bousquet. The scientists will be able to study the impact of these winds — 10 times stronger than the ones hitting Earth’s atmosphere — on Mercury’s magnetic field. The BepiColombo mission will deploy two spacecraft. The Mercury Planet Orbiter, built by ESA, will investigate planet’s surface and interior composition. The Mercury Magnetospheric Orbiter, made by the Japan Aerospace Exploration Agency, will study the region of space around the planet that is influenced by its magnetic field. The mission will also look for tectonic activity, and seek to understand why spectroscopic observations show no iron even if it is thought to be one of the planet’s major component elements. Compared to Mars, Venus, and Saturn, Mercury has barely been explored. Only two spacecraft have ever paid it a visit. NASA’s Mariner 10 did three flybys in 1974 and 1975, providing the first up-close images. More than 30 years later, NASA’s Messenger did the same, before settling into orbit around Mercury in 2011. The new mission is named after Giuseppe (Bepi) Colombo, a brilliant Italian mathematician and engineer who first understood the relationship between Mercury’s rotation and orbit.